Go Goals! - Gamepedia. Search for more sustainability games. The aim of the UN Regional Information Centre for Western Europe (UNRIC) is to help people understand their role in the future of the planet as individuals, team players and responsible global citizens. Especially younger generations need to be key players for a brighter future. For this purpose the UNRIC has created the “Go-Goals!” game for children aged 8-10. Designed to be fun and engaging, this game informs children while motivating them to actively pursue the SDGs. single dice. Each player places their token on the Start field. Players take turns to roll the dice and move their tokens forward the number of spaces as shown on the dice. If a player lands at the bottom of a ladder, they can immediately climb to the top. If a player lands at the top of a waterslide, they immediately move to the bottom of the slide. 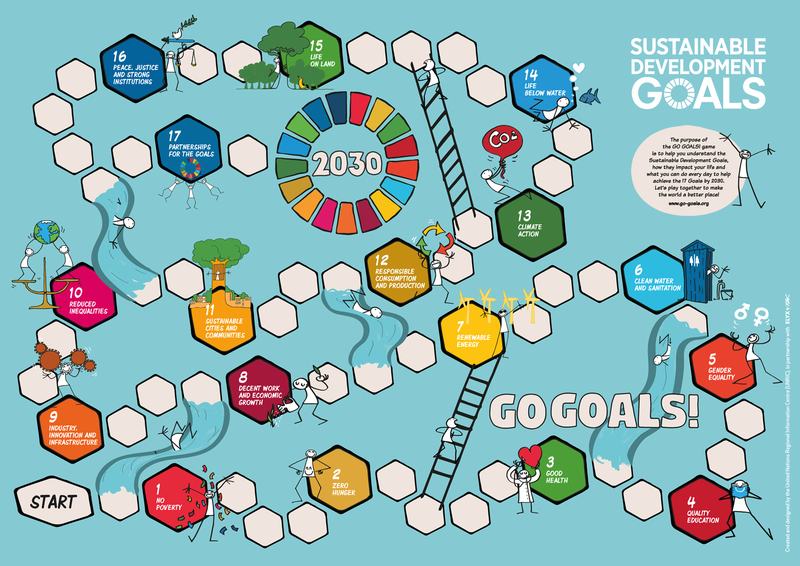 If a player lands on a Sustainable Development Goal field (1-17), they can draw a card corresponding to the goal number. Another player should read the card question. A correct answer from the card drawer will allow the player to roll the dice once again. The first player to arrive on the field ’2030’ is the winner! If a player throws the required number, they must step forward into field ‘2030’ and then move backwards the surplus number of spaces. 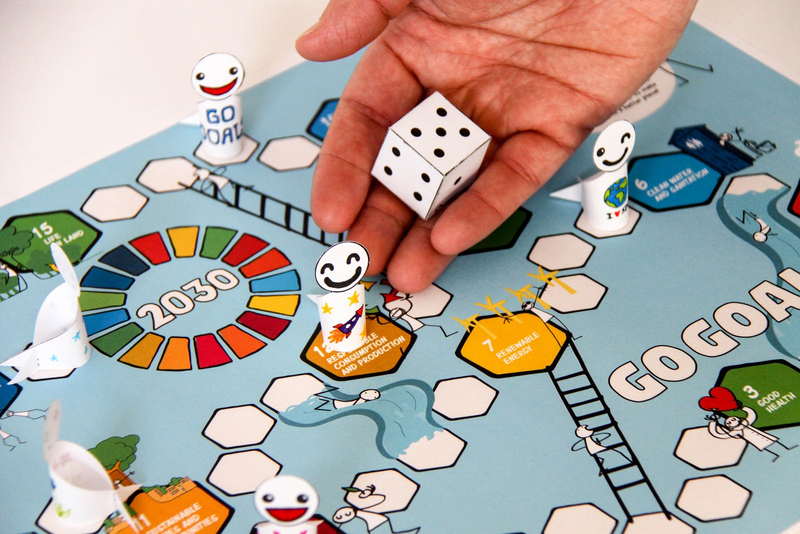 The “Go-Goals!” SDG board game helps children understand the Sustainable Development Goals, how the global aims impact kids’ lives and what they can do every day to help achieve the 17 Goals by 2030. The game can also be used as a tool to learn a foreign language. Children are encouraged to develop their own set of questions and to discuss the ways in which they can implement the SDGs at home and at school. The team at UNRIC is looking forward to receiving feedback, pictures, videos, questions etc., and open to new language versions. You can write to them at info@go-goals.org.